Samford University has an estimated annual economic impact of more than $335 million on the state of Alabama, according to a recent study. The independent study was conducted by Samuel Addy and Ahmad Ijaz with the Center for Business and Economic Research at the University of Alabama. The study results were released through Betsy Bugg Holloway, Samford’s chief marketing officer, who coordinated the project for the university. Holloway noted that the study coincides with the university’s current strategic planning process and comes as the university announced that it had exceeded its $200 million fundraising campaign goal. For 2012-13, the most recent year for which complete data was available, Samford’s economic and fiscal impact was $335.1 million, 2,438 jobs and $13.2 million in income and sales taxes. That is almost $1 million per day, Holloway noted. The majority of the impact -- $319 million, $4.3 million in local sales tax revenue and 1,990 jobs – is in the seven-county Birmingham-Hoover metropolitan area. Samford’s campus is located in the Birmingham suburb of Homewood. According to the report, the state gains indirectly because Samford graduates pay “relatively higher taxes” than they otherwise would have. 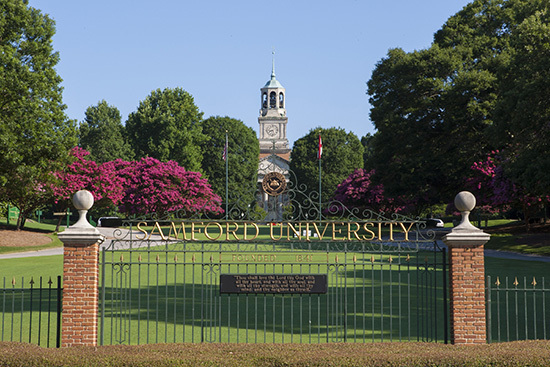 “Over their working lives, the 2012-13 Samford University graduating class will pay $217.4 million in additional income and sales taxes -- $152.5 million state and about $64.9 million local – than they would have without a Samford degree,” according to the report. Alumni may pay more in taxes because they likely would earn and spend more than they would without their degrees. The researchers also estimated that visitors to the university had an estimated annual economic impact of $15.3 million. Holloway said the university estimates it has more than 100,000 visitors annually. In addition to its own athletics and arts events, the university serves as a performance venue for the Alabama Symphony Orchestra, the Alabama Ballet and OperaBirmingham, and hosts the Miss Alabama pageant, Alabama Governor’s School, All-State Choral Festivals and a wide range of other arts and athletics events. The report used two types of economic impact to determine Samford’s total economic and fiscal impact. Household impact – jobs and earnings to households – deals with the economic and fiscal impacts derived from Samford spending that affects households. The other focuses on broad, economy-wide factors that consider all expenditures such as gross business sales and its components. “The positive real rates of return and their magnitude indicate that the decision to pursue a Samford degree is very sensible. These real investment returns are better than the long-term returns on investments in U.S. equity markets,” the report notes. According to the study, the real annual rate of return on some college attendance is 6.2 percent over a high school graduate. The bachelor’s degree has a 9 percent real annual rate of return over some college attendance, and the master’s degree yields a 17.5 percent return over a bachelor’s degree. The doctorate provides a 13.3 percent return over the master’s degree and has the highest lifetime earnings. About 37 percent of Samford’s students are in graduate and professional programs beyond the bachelor’s degree. Holloway said the study reinforces the university’s mission and shows that “a Samford education is a prudent investment” and that the university has “a significant impact” on the state and area economies. Holloway also noted that Samford has had four consecutive years of record enrollments and attracts students from 44 states and 22 countries, many of whom stay in the region after graduation. The university also has received several high national rankings in the last year for academic programs, value and affordability, and was ranked third in the South among regional universities in the 2014 U.S. News & World Report college rankings. Forbes, Inc., recently ranked Samford as the top university in Alabama.